… and absolutely hate it! Or maybe you don’t hate it, but you think that it’s average at best and not worth any more effort. If you’ve had this happen to you, don’t worry. I know how you feel! This very same thing used to happen to me all the time. And every time it happened I would get that sinking feeling that told me I was a terrible artist. Well, if you never want to live through this situation again, I’ve got some very interesting information for you! First though, let me ask you (yet another) question. Have you ever played a game with a friend or by yourself, where you take different members from different musical groups and combine them to form a kind of “ultimate group”? If you haven’t played this game before, have a quick go now. Simply choose a group of musicians who you think would form an absolutely amazing band. Now think for a moment, if you could hear these musicians all playing together in their respective styles, wouldn’t it sound simply breathtaking? I know I’d love to hear MY ultimate band playing together! At this stage you might be thinking why I’d ask you to play this strange game. The reason that you chose each musician to become a part of your “dream group” is because of some programming that exists in your mind. And it's possible to use this very same programming to teach yourself how to write music that sounds like this amazing super group you've just created. This programming determines what type of music you love, what you hate, and everything in between. I call this programming your “internal criteria”. And the reason that you chose certain musicians to be in your “dream group”, is because their style of playing matches up with your “internal criteria” for what great music is all about. Can you remember how I discussed how devastating it can be to work on music for ages and ending up with something that is stale and boring? Well, I made an exciting discovery a while back that can completely prevent this situation from happening to you ever again. 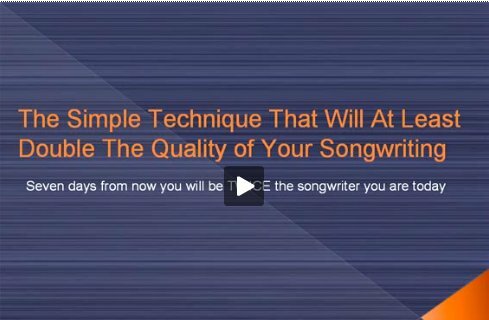 What I discovered was this: It’s possible to USE your internal criteria toprogram your mind to create music and lyrics that is in perfect alignment with this criteria. This means that every time you create something, it will have the qualities of music that you love. Therefore you will love the music and lyrics you create! Can you imagine sitting down to write some music or lyrics and knowing that you are going to create something you absolutely love? It’s a fascinating and enjoyable experience to say the least! 2. Re-program your mind in a way that forces you to automatically write in this new way. … Music that you LOVE!